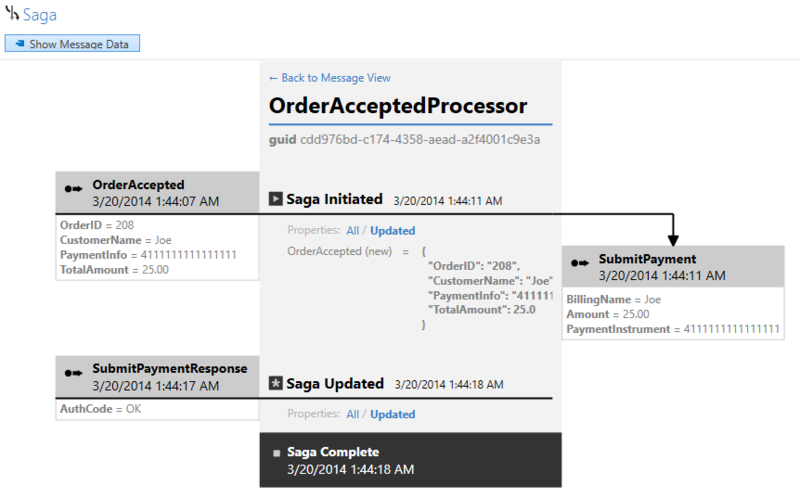 The SagaAudit plugin enables the Saga View feature in ServiceInsight. It is built specifically to help developers verify saga logic during development. It does this by capturing saga message behavior and changes in saga data/state as the saga is being processed. It then sends this information to a ServiceControl endpoint setup in the development environment. The information is available in the Saga view in ServiceInsight. A snapshot of the current saga state. All this information is sent to and stored in ServiceControl. Note that the saga state audit data is transmitted to ServiceControl via a separate message and is serialized using the built in JSON Serializer of NServiceBus. In order to not run it in Production environments at all times it is advised to enable it conditionally, based on an environment variable or configuration setting. To temporarily start visualizing a saga in production, change the setting and restart the endpoint. Use ServiceInsight to view the visualization and when done, change the configuration back and restart the service.